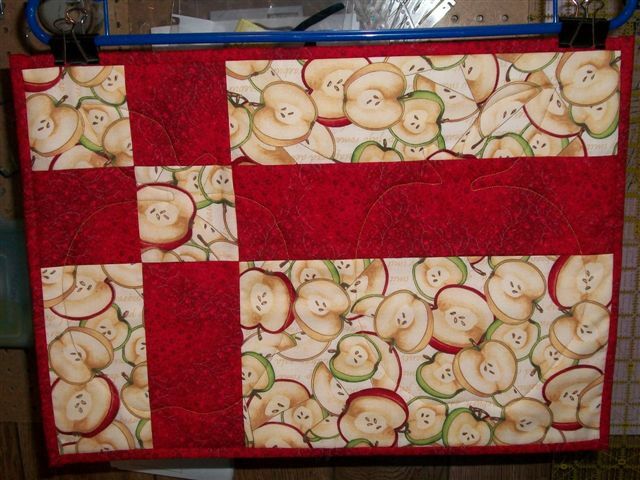 Does anyone have a good site for place mat patterns. I keep being told that I can just make a small table runner. However, I would really like an actual pattern. Any help is greatly appreciated. I just "googled" quilted placemats free patterns and there's a TON available. there were some good ideas the last time you posted this request, mvalley. If you are having a hard time finding your first post, check your profile. I have some table runner patterns in my quilt books. My table usually has too much quilting stuff on it. No room for place mats. add some borders to make it the size you want. You can use any bl ock to make a mat. This is something I made up myself. I can send you the sizes if you are interested. Thanks, Debra! Somehow I missed this one in my placemat search. Me too! I like the looks of this placemat. I have fabric that will make beautiful placemats and I have been looking for just the right pattern! This is it!! Check out www.e-patternscentral.com. If you sign up you will get daily e-mails. They have a section of books of patterns. Right now they are all on sale at about 50% off. I saw books of table runners, which often include placemats. A book often has up to 200 pages, so lots of patterns. http://www.allfreesewing.com/?task=s...term=placemats Try this site. All free sewing has lots of placemat patterns. Besides going online as the replies below suggest, I often make one block, then add a 2-3" border on one side of the block, or 2" on both sides, whichever floats your boat. Good luck. I have had several request for the cutting sizes of the placemat that I showed. I am so happy that this many of you like it. Here it is. Have fun. Thanks for the pattern! I've got just the fabric to use. I usually go to Pinterest when looking for ideas. Thanks Boston 1954.....I would love to try this. Thanks for the dimensions. Thanks for the pattern Boston1954.